I received a phone call two weeks ago that brought my attention to a case of questionable police action in Jyväskylä, central Finland. I hoped the situation would be rectified fast enough so that I would not have to write this blog post. The incident hit a little too close to home because it involved someone I know personally. 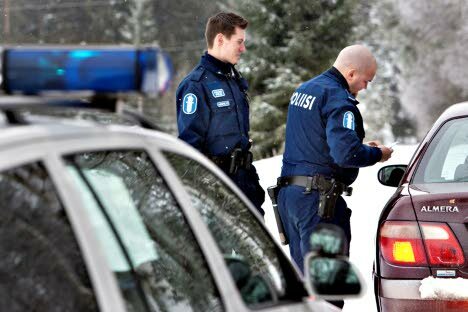 It puts into question the professional conduct of Finland's traffic police and their commitment to guarantee everyone within Finland's borders equal protection without distinction of any kind. On 28.10.2012, a friend of African origin was driving from Oulu in northern Finland to Helsinki in the south. After driving for about 4.5 hours, he noticed a police van by the side of the road. The van followed him and drove directly behind him for about 20 minutes - during which he committed no traffic offence - then pulled him over. He was invited into the van - where his driving licence and car registration were checked. One of the police officers [name withheld] told him that an unknown person (presumably a motorist) had called the police and reported that he (my friend) had violated traffic rules by overtaking in an area where he was not supposed to. According to the [ghost] caller, my friend drove over a solid yellow line towards on-coming traffic. The driver disputed the claim to no avail. According to a written report he submitted to a number of authorities in Helsinki, including the Central Police Department and the Registry of the Ministry of Justice, the police intimidated him to admit the traffic offense but he did not. My friend's license was confiscation based on an alleged phone call from an unknown caller. One of the officers said he "trusted" the caller hence seized the driver's license for "gross" traffic violation. In a clear case of one man's word against another's, the police chose to believe one party without enough evidence to support his/her claim. This constitutes a due-process violation and goes against values of fairness and objectivity of the National Traffic Police. Everyone with a driver's license in Finland should be concerned. The action of the police in this case is an indication that it only takes one phone call from an unknown caller for a driving licence to be suspended. Anyone who perhaps does not like you - either because you are an immigrant, Roma, Black, White, Hispanic, Christian or Muslim - could exploit this simple option: call the police and have your license seized thereby making life difficult for you. Imagine a world where police acted purely on hearsay. People would exploit the situation for personal gains. It was only after confiscating the driving licence that my friend was tested for alcohol. According to his report, he had not drank alcohol for weeks. He was clean. The police took his license and issued him a 5-hour authorization to drive home. He has not driven since 28.10.2012 and as of the time of this writing, he has not heard anything from the police. He has been left in the dark for two weeks without any information about his license. The police acted strictly on hearsay. As law enforcement officers, they know better. Hearsay is not admissible in the eyes of the law, yet they seized someone's license because they "heard" that he had committed a gross traffic violation. Mindful of reports about the rise of racism and xenophobia in Finland, it is plausible to believe that the immediate seizure of the driving licence of a driver of African descent without due process was motivated by bias, race, color, ethnicity or other discriminatory grounds. Based on the conviction that bias and discriminatory motives instigated the seizure of the license in question, we decided to petition the authorities to immediately restore the arbitrarily suspended right to drive. The petition is addressed to Mr. Kari Rantala, Chief of the National Traffic Police. In a country where xenophobia runs deep, it is dangerous for the police to take drastic measures based on phone calls from unknown callers. Punitive measure based on phone calls could encourage xenophobes to victimize immigrants and other people with foreign backgrounds by making unsubstantiated calls to the police. While such calls should not be dismissed entirely, there should be thoroughly investigated before acting upon. Seizing a driver's license without enough evidence amounts to abuse of power and a violation of his right to due process and perhaps equal protection of the law. A petition needs signatures in order for it to have more weight. Please, add your voice to the call for the restoration of the driving licence in question by signing the petition. Your signature could make a difference. The petition will be open for signatures until Sunday 18.11.2012 at midday. It will be delivered to the Chief of the National Traffic Police on 19.11.2012. The driver whose license was confisticated wishes to remain anonymous online. However, his name is mentioned in the petition that will be delivered to the traffic police chief.